After a deal with Swedish label Despotz Records was signed, Larry, Pete, Pat and Emp entered The Overlook Studio in Gävle to record the bands fifth studio album, named 1981. And it is already rumored to be a horror experience on the same level as those old school slasher classics. So pop the popcorn, call for pizza and bring your friends, this twisted and demented world of knife wielding maniacs has only just started. Let the body count begin! 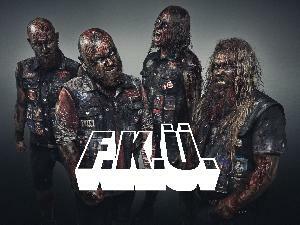 Four young men started F.K.Ü. back in 1987 to pay tribute to their two main interests, horror movies from the 1980´s and thrash metal. But after just a handful of rehearsals, the band fell into a hiatus. Ten years later, in 1997 a decision was made to make another try and bring the monster back to life. The overwhelming response of the 20-song demo Beware of the Evil Underwear that was recorded in 1998, resulted in Metal Moshing Mad. This 22-track mosher showed the world that it is possible to have a good, friendly, but still violent time in the mosh pit. Classics like Maniac, Halloween, Friday the 13th, Hellraiser and The Texas Chainsaw Massacre was covered on this epic horror themed album. In 2004, the world was in desperate need for another dose of some patented Horror Thrash Metal signed F.K.Ü. and the album Sometimes They Come Back… To Mosh was released. The inspiration was once again from the thrash and horror movies of the 1980´s. Movies covered on “Sometimes They Come Back… to Mosh” are Christine, Shockwaves, C.H.U.D, Maniac Cop, Motel Hell and The Fog. After a bunch of awesome shows, including a short but sweet west coast US tour, they go back into the studio to make album number three. Come the summer of 2009 and the release of Where Moshers Dwell. An album filled with prime neck breaking, horror-inspired, sing-along thrash madness. Movies covered on Where Moshers Dwell are Dead and Buried, The Return of The Living Dead, Creepshow, The Toolbox Murders, The Town That Dreaded Sundown, and The Exorcist. In 2010 and 2011 F.K.Ü. tours Sweden extensively and plays all major Swedish festivals such as Sweden Rock Festival, Metaltown, Getaway Rock Festival & House of Metal, to name a few. In 2013 the band returns with another blistering slab of their patented horror metal. Their fourth album titled 4: Rise of the Mosh Mongers released by Napalm Records sees F.K.Ü. fire on all 4 cylinders. Produced and mixed by the bands singer Larry Lethal, the album contains 17 tracks of pure thrashing bliss. Movies covered on 4: Rise of the Mosh Mongers are Event Horizon, The Amityville Horror, Madman, Terror Train, Near Dark, The Boogey Man and Videodrome.